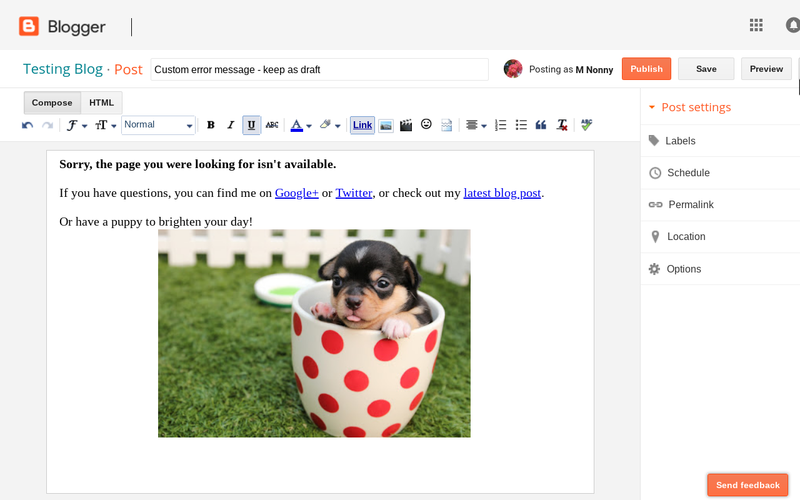 The format depends on your Blogger blog's Theme, but the message is the same. 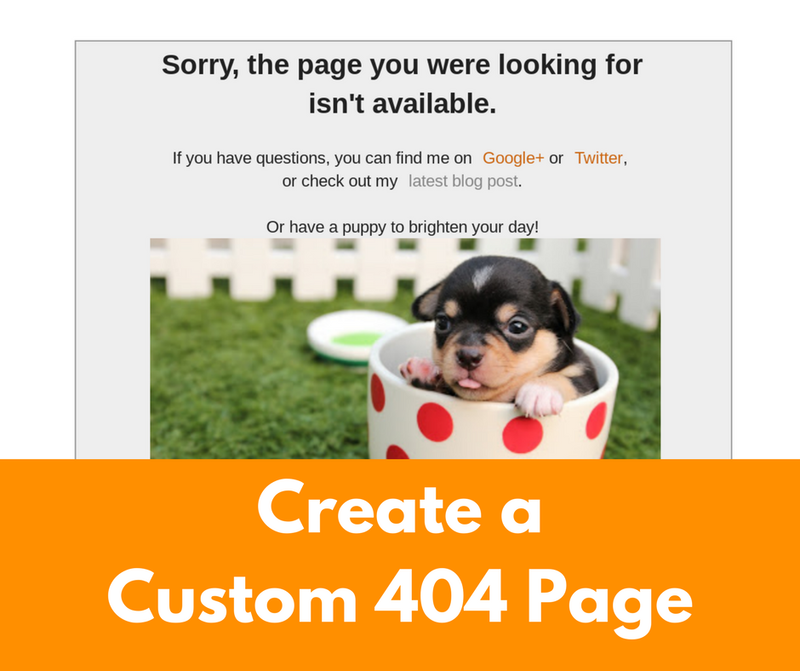 How create a custom "Page Not Found" message for your own Blogger blog. Paste in the HTML of your Custom Error Page and click "Save Changes"
Note that the HTML must be less than 10,000 characters. You can test how your error page looks by trying to open a page on your blog that doesn't exist - just add random characters after a slash at the end of your blog's URL. At a minimum add navigation links to help people find what they are looking for. That is what I've done on this blog's error page. 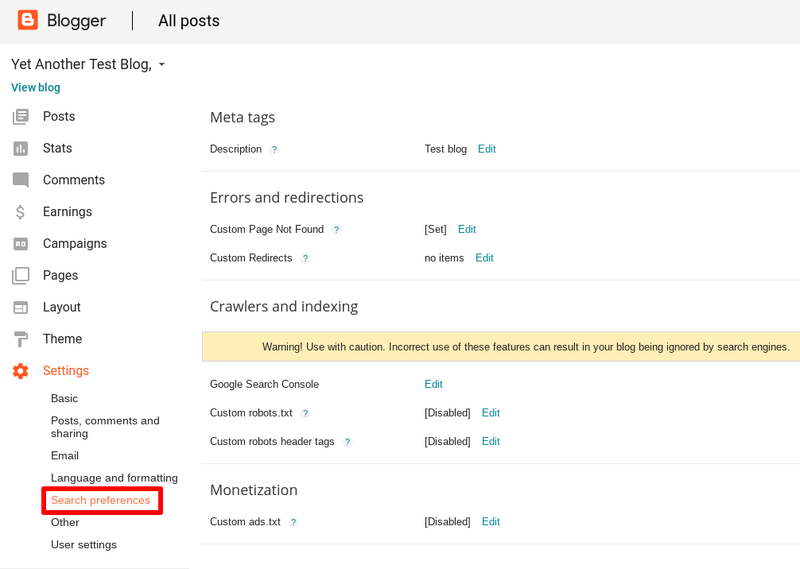 The links can go to your blog's home page, a label, static page or links to popular posts. And, of course, a friendly greeting and nice picture. 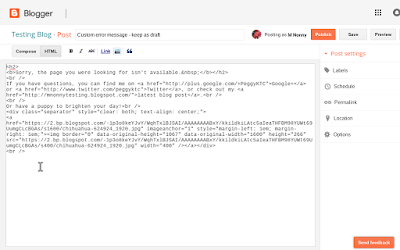 Here are the Google Webmaster guidelines and suggestions for Custom 404 pages. If you know HTML, or just want to add a brief message, you could create your custom error page right in the Custom Error Page settings box. But for a more formatted page or for adding an image, the easiest way to do that is to create a draft Blogger blog post and copy the HTML. 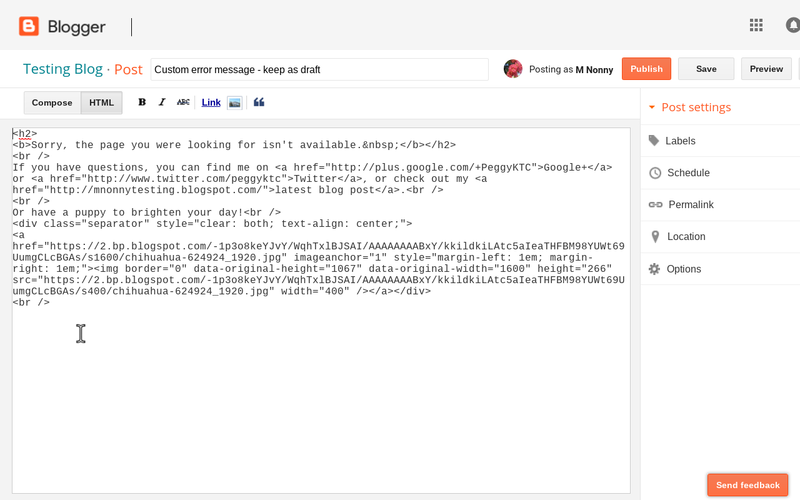 Custom Error Messages can be configured in your blog's Search Preferences Settings. Now you can create your blog's Custom Error Page. I have tried a number of tutorials - mostly the same thing explained slightly differently - but am not having any joy. The previous blog template I was using worked fine for this, but the current one seems to have an issue I cannot identify. Would appreciate your thoughts on what I need to do. Thanks! Hi Beka: did you create a custom error page? 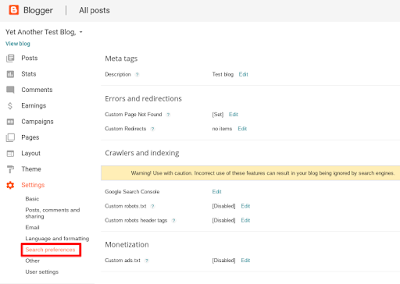 The error page should not redirect to a Blogger page you created, as that would not correctly register as an error. You need to copy the HTML of the page your created, and then enter that HTML in the "Custom Page Not Found" settings, as I outline in my tutorial. Hi Peggy. Thanks for getting back to me. Yes. I followed the instructions exactly. No luck. My previous template did indeed have the standard 404 redirect to a custom page that I created for the job but this no longer seems to be working with the new one. When you use the search option for 'zombies' (for example) nothing comes up either. Seems that there is something missing altogether for both the 'no results found' with search, or for pages/posts that have been removed. Have only just got around to this. On my old blog - your instructions work perfectly! The new one using the Soho template ... says bluntly ... there's nothing here. Sigh. Custom page not found doesn't work with the new themes. And that is where I need it!